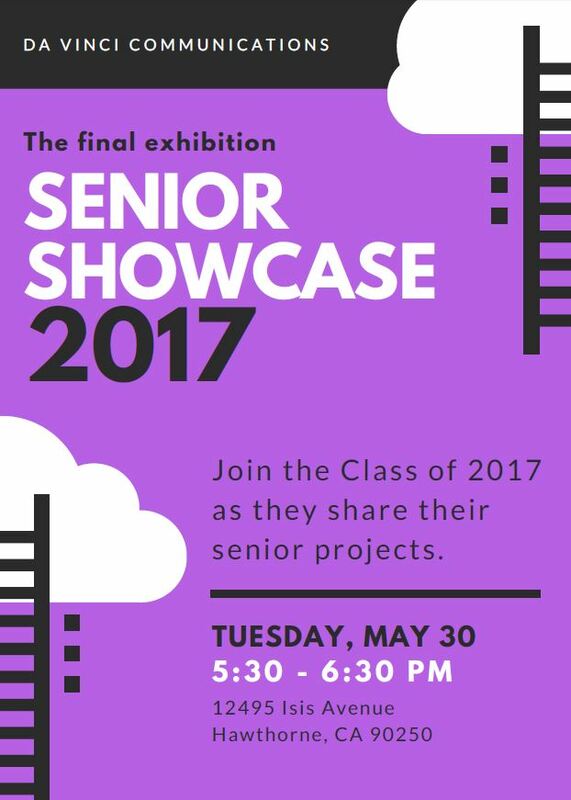 Families – everyone is invited to join us, and senior families, please come out to support your graduating students on Tuesday May 30th at 5:30 to celebrate the work that seniors did this semester at our DVC Senior Showcase. The students will be sharing their Senior Projects on the DVC campus from 5:30-6:30. We look forward to seeing you there! POLs begin on Tuesday, and as such we have our minimum day schedules. We have a normal Friday schedule tomorrow, followed by the POL half day schedule all next week and June 5th and 6th. The last day of school on June 7th is a full day. We would like to extend an invitation to all parents to attend and see their child’s POL and see their growth as a learning in this past year. Reminder: We will be taking a senior class photo during senior breakfast! Graduation tickets were passed out to most students today. If you didn’t get your tickets today, make sure you come by Nathan’s office tomorrow morning to pick up your tickets. Thank you to all of the junior families that showed up to speak with Brittany about senior year plans. If you missed the meeting, I will hand out the packets and current transcripts out to students on Friday. Posse offers these selected students the opportunity to pursue both academic and personal excellence by partnering with universities countrywide and awarding them with four-year, full-tuition leadership scholarships. The Posse Foundation selects only 10 students per college in the Los Angeles area making the process extremely competitive. In order to qualify for the scholarship, the student must fill out The Posse Foundation Application Nomination Form located in the office. All applications are due May 31st and students will find out if they are nominated during POLS week. Once nominated, the student will part-take in a three-part process, including large group and individual interviews. Posse staff and university partner administrators ultimately select a diverse group of 10 students for each college or university, thus forming a Posse. Please encourage your child to apply to the Posse Foundation. Senior Beach Day: In order to go to senior beach day, you must be passing all of your classes required for graduation, and pass your senior project POL. Make sure you are on pace to do so! Permission slips are attached. All parents are invited to join us for senior breakfast and awards – come celebrate! Seniors can purchase a gown from Jackie in the front office, or rent the gown for free. The cap is included free of charge whichever option you choose. Graduation Tickets will be distributed on Tuesday 5/23. By default, all families are given eight tickets to graduation. If you would like to request more tickets, simply request more using the online form on the DVC Portal. If you have already requested tickets as of 5/21, they will be included in the tickets passed out on Tuesday 5/23. Valedictorian Applications are available in the front office as well as included in this packet. Students with a weighted GPA of 4.0 or higher are eligible to apply. Senior speaker applications are available in the office and included in this packet as well. All students are eligible to apply to speak with the theme of DVC family culture, and applications will be handed in with speech samples on Thursday, May 25th at 4:15pm in Eynon’s classroom. Seniors are welcome to come to school and be inside of senior classrooms signing yearbooks and such on June 7th from 9:00am to 1:30pm. At 1:30pm we will load buses to go to Disney Land for grad night. Buses will return around 3:00am to DVC. Payments for grad night should be made to Jackie in the front office, and can be made by cash, check or credit card. Reminder: participation in all senior events, INCLUDING GRADUATION, is dependent on students’ successful academic progress and being a positive presence on campus (aka, no disciplinary action). See additional details in the packet attached. Reminder – POLs start next week, with minimum days for students. Make sure students arrive at school at 8:00am if they are in the morning group. We will be hosing another New Campus Update Meeting, presented by some of our seniors who have been working on communications for the big move! Come on by to see the latest developments and ask any questions you want about the new building! Seniors and Juniors – prom is this Friday! Remember, doors open at 6pm, and you must be at prom before 7pm in order to be admitted – make sure you come early, and have an amazing Prom Weekend! Reminder – there is one more DVX meet and chat happening this Friday! Please join us for an informal opportunity to meet with DVX coaches one-on-one and in small groups. You will have the opportunity to ask specific questions about your personal situation and learn more about the program in general.